The word spine is most commonly known as the backbone or spinal cord of the human skeleton. Another meaning stands for a book's jacket. 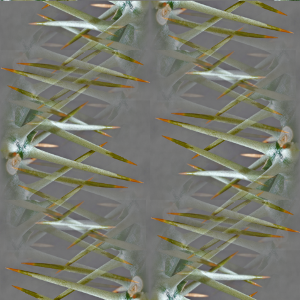 Our picture on the right side shows the spines of a cactus, artistically changed into something which looks like a ribcage. You will hardly find the usage of matplotlib in a dictionary. Spines in matplotlib are the lines connecting the axis tick marks and noting the boundaries of the data area. We will demonstrate in the following that the spines can be placed at arbitrary positions. But before we can start with our first example, we need to introduce the gca function, which returns the current Axes instance on the current figure. We can e.g. call plt.gca(projection='polar') to get the current polar axes on the current figure. We want to rename the xticks now with custom markers. We will use the method xticks again for this purpose as we did in our previous examples. But this time we will call xticks with two parameters: The first one is the same list we used before, i.e. the positions on the x axis, where we want to have the ticks. The second parameter is a list of the same size with corresponding LaTeX tick marks, i.e. the text which we want to see instead of the values. The LaTeX notation has to be a raw string in most cases to suppress the escaping mechanism of Python, because the LaTeX notation heavily uses and relies on the backslash. We want to increase the legibility of the ticklabels. We will increase the font size, and we will render them on a semi transparant background.